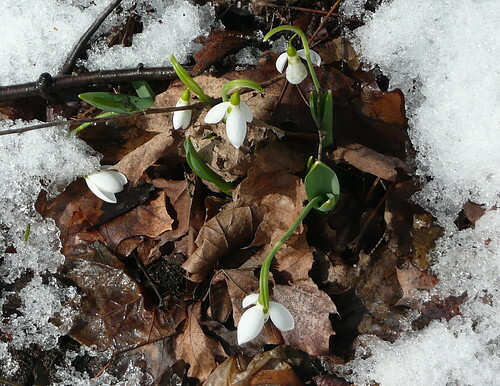 Less than a week ago, the sky dumped more than a foot of snow on this spot; today, a warm, spring-like morning revealed the first snowdrops, right on schedule. These mild, muddy, and unbelievably bright days are our reward for weathering another long New England winter: a reminder that underground, perennial roots have harbored hope that spring will return again, eventually. What a lovely spring-is-here photograph; that’s a particularly interesting shade of brown, which contrasts neatly with the crystals and the creamy blossoms. To the best of my recollection I don’t recollect ever having seen a snow drop. Yes, the various shades of brown during “mud season” are quite interesting in a muted, monochromatic way. Snowdrops make sense in this kind of setting: they’re hearty, and they look lovely against snow, mud, or last year’s leaves. I suspect the snowdrops are long gone by the time you arrive in New England, twoblueday. I think they exist solely to cheer us year-rounders. Spring must come to Newton sooner than Belmont! I remember last year you saw crocuses or snowdrops long before I spotted any (in Cambridge, I believe). I saw crocuses (and tulips and daffodils) in Santa Fe last week, but I’ll be keeping an eye out for anything coming up here. Actually, I think spring comes sooner to this particular spot than it does anywhere else in Newton, as it’s the same yard where I saw the first snowdrops and crocuses last year. I think this spot gets good direct sunlight…and there’s usually a thick litter of leaves to add a warming compost-effect. Either that or there’s an underground thermal spring warming & waking these perennials before any others!